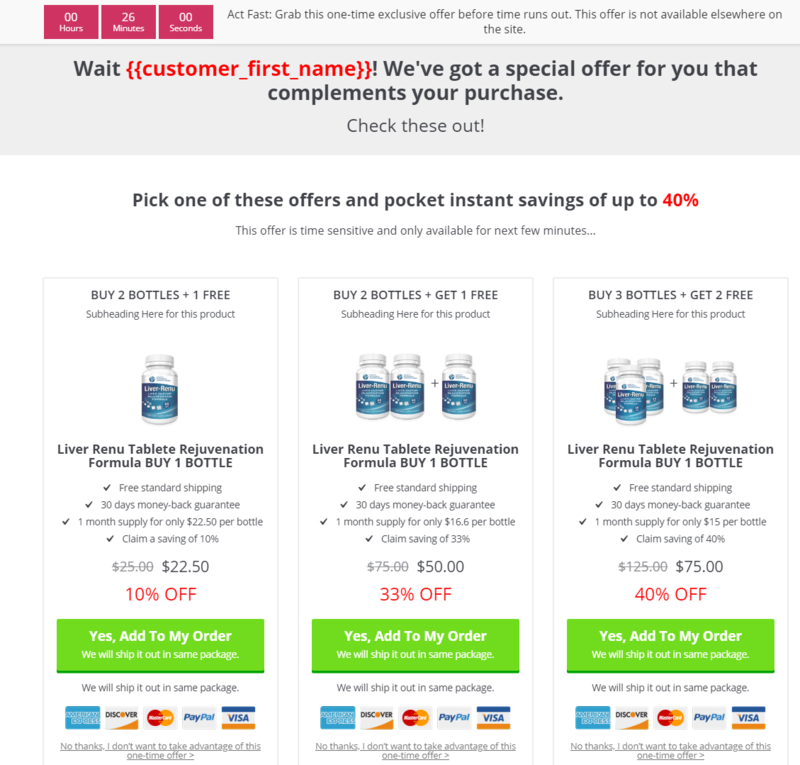 Multiple Upsell Offers On One Page: Are You Deploying This Nifty Tactic? Multiple Upsell Offers On One Page: Are You Deploying This Nifty Upsell Technique? When 5 people buy the lowest plan, you make about $150. And when just one person buys your highest plan, your sale doubles in a single sweet shot! That’s the power of offering a choice between multiple offers. Yet most of us leave it at one. Even when it comes to upselling, we create one offer and pin high hopes on it. In this post, I’ll show you how to create multiple offers and present them on one page as different options. You will be surprised by its impact on your own upsell revenue. That’s my promise. But first, let’s understand why you should always offer more options than one. Let’s take a look at just some of the reasons why offering a choice works better than having one single offer. In a behavioral science study, they divided the participants into three different groups and asked them to buy DVD players. One group was given the option to buy the Sony DVD player and the other group, a Philips player. But to the third group, they offered a choice between Sony and Philips DVD players. Turns out only 9% and 10% people in the first and second group respectively bought the player. The third group produced astounding results- a staggering 32% of people chose Sony and 34% went with Philips. The conversions skyrocketed by 650% just because people had more options than one. This also proves that having no alternatives kept a large majority of people from buying. The most dominant pricing strategy on the internet today is the three-pronged pricing strategy. You see it everywhere because it works. Three-pronged pricing strategy allows people to pay what they want. The price increases as the services offered increase. It gives people the option to pay what they can. They can choose to shell out extra money to get more features of a product, more services or just an overall better deal. And there will always be a percentage of people who will do that if given a choice. 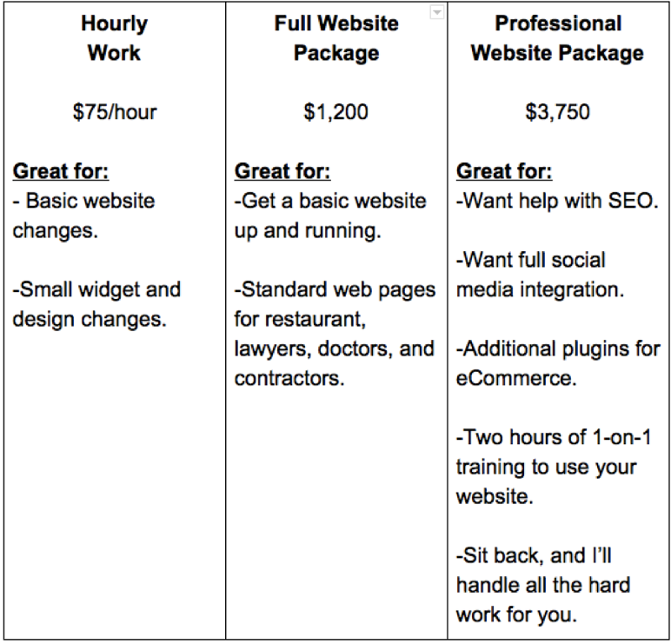 Neville Medhora wrote a story about how he was going to charge one his clients $500 for some SEO work but actually ended bagging a contract worth $5000. 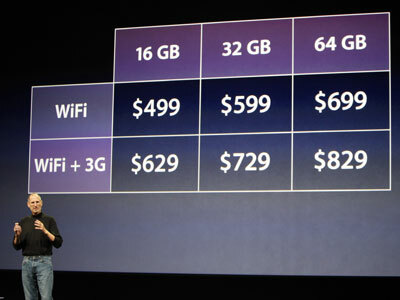 That sure seems like a huge jump but not when you have a pricing plan in the middle of those two at $1000. Russel Brunson of ClickFunnels conducted a conversion case study in which they offered buyers a choice between three lucrative upsell offers. People could choose between 1 month supply, 3 months and 6 months of supply of the same cream. The discount got deeper as the price to pay increased. Interestingly, the $69 single cream pack became the most purchased option even though Russel admits it was a high price to pay for one. When they removed the first option (6 months supply i.e. buy 4 get 2), their profits went down by 15%. But when they removed the middle option (3 Month Supply i.e. 2+1), their profits increased by 83%. This shows – two options converted better than three. And the first option i.e. 6 month of supply was a great decoy. It established a large price in the minds the buyers and the other prices in comparison looked smaller. They say if you want to sell a $2000 watch, place it next to a $10,000 watch. When people have multiple options, they start comparing. They want to know what they’re getting, what they’re saving and which one of those offers make for a better deal. They tend to compare the prices of different offers to zero in on the best value deal. Had he said, “We were thinking of pricing it at $399, but we decided to go for $499,” it would have felt like a ripoff — even though nothing would have actually changed. That’s price anchoring in flesh and bone. Imagine, even though its close competitor, Kindle was priced lower, journalists termed the price as aggressive for the way it was presented. I will now show you how to set up multiple upsell offers and display them on one page. You can present them in either list format (one below the other) or grid format (one next to the other). 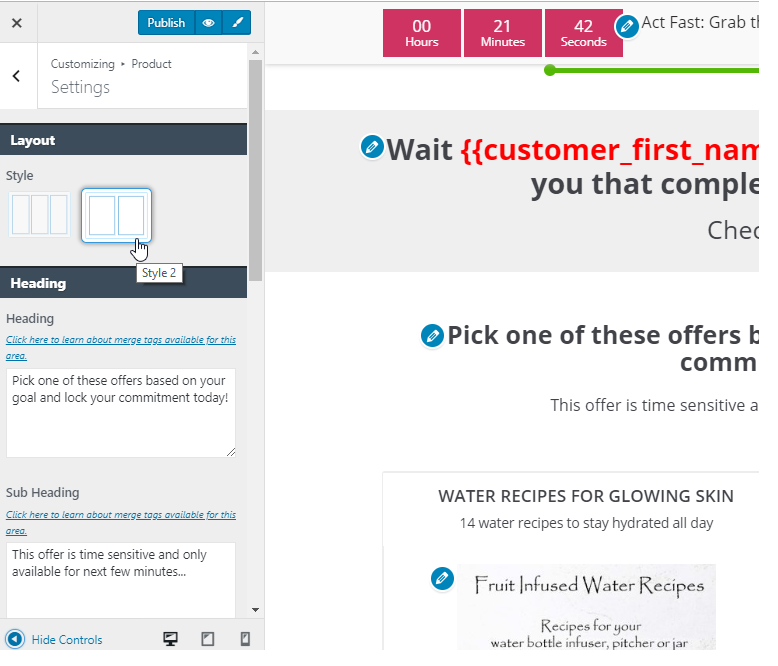 Let’s now look at the step-by-step process to set up multiple offers on a single page. UpStroke allows you to pick a rule from the basic and the advanced list. 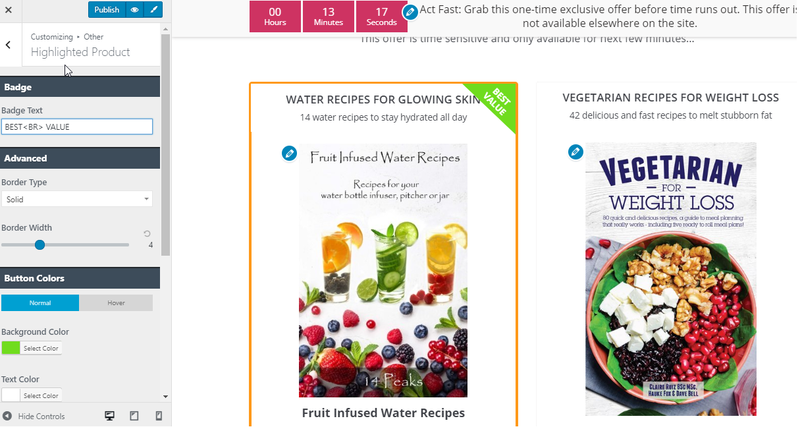 Show the upsell page when the specific product(s) are bought or products from a chosen category are bought and more such rules. You can even set up multiple rules in conjunction with each other using the ‘and’ & ‘or’ functionality. 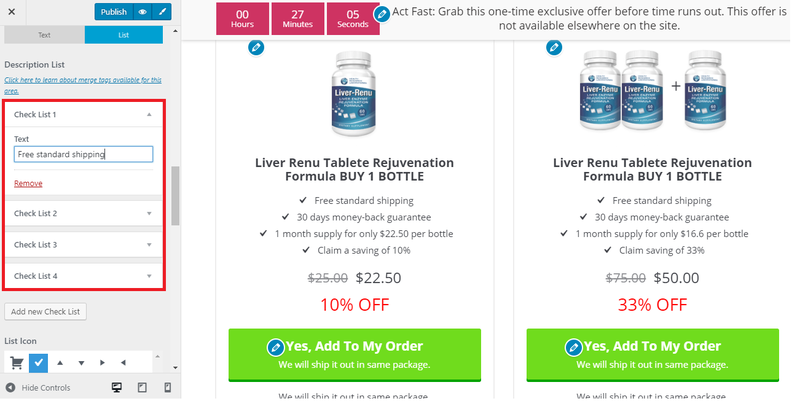 In this case, we’ve selected ‘Product(s) contains exactly 1 of Liver Tablets’. Next up we’ll create the offers. 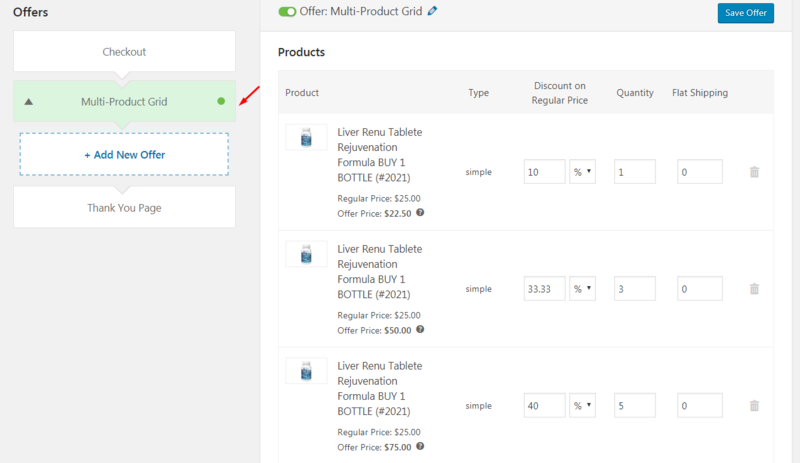 You can add multiple products here to show on one single page. But the option to add multiple products is only available when you have the multi-product add-on. The multi-product add-on is only available on the business plan. 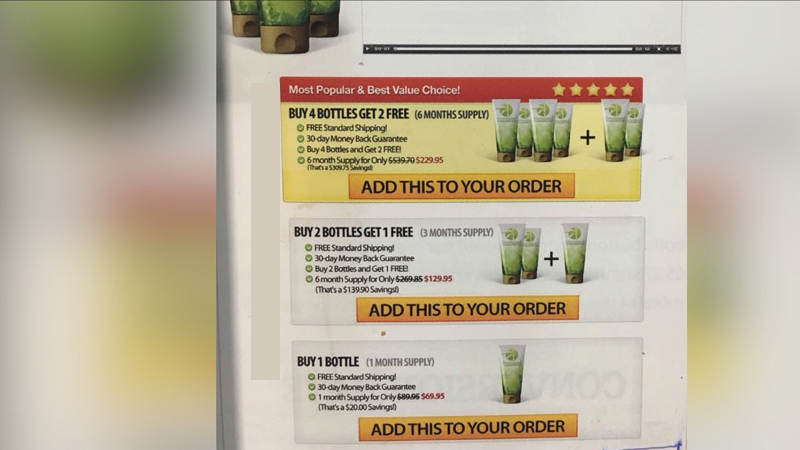 If you’re creating volume based offers around the same product – then you’ll have to select the same product multiple times. For example, in this case, we’ve selected the tablets thrice and each time added a different discount & quantity. Select products and create offers around each. Set up the discount & qty. based on your requirement. As you can notice, when they buy 1 pack – they save only 10% but when they buy 3, they save 33.33% and finally on buying 5, they save 40%. This is equivalent to saying ‘Buy 1 at 10% off’ or ‘Buy 2 get 1 free’ or ‘Buy 3 get 2 free’. Next, create your bullet points to explain each of the offers well. You can highlight details about shipping, the number of months it’s last, the savings they’ll make. The idea behind writing details in bullets or list format over paragraph format is that it helps people quickly compare multiple options. The process of making a decision becomes fast and easy. Offer a choice between only two competing offers. In this case, they can pick the offer based on their goal/need. 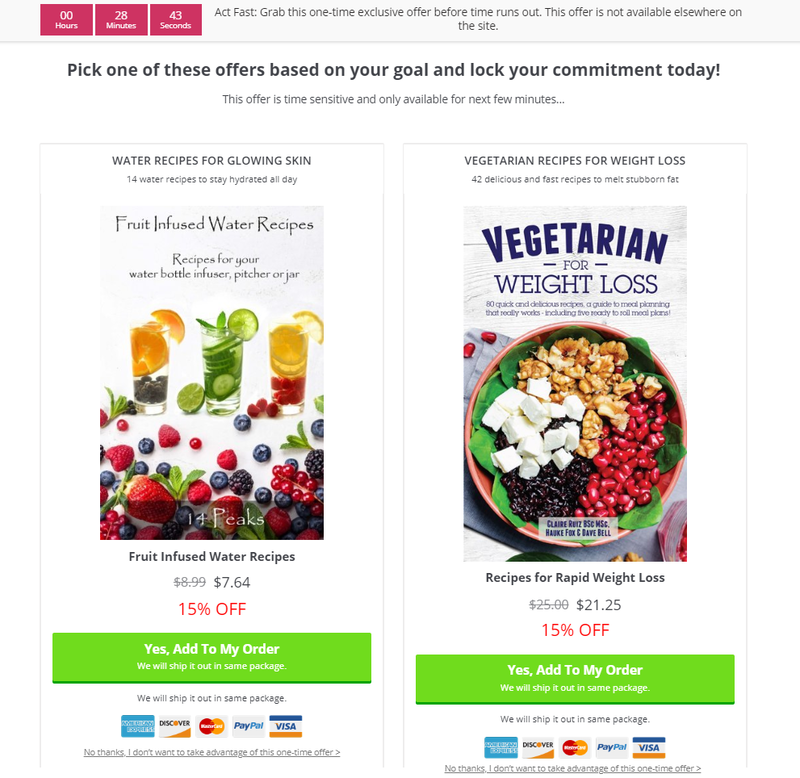 People can pick one of these two offers based on their goal – hydrated & glowing skin or weight loss. Highlighting your best value deal or most popular choice, helps people take a decision fast. Most people like to go with social proof and believe what everyone else is buying must be good. That’s it! You’re ready to roll. As I reach the end of this post – I want you to take a moment to think about the options you had when you were making little decisions in your life. It’s easier to decide when you have a choice- you can quickly reach out to one of the options in the list. Therefore when people say – ‘if your product is good enough it should sell on its own‘, they really aren’t taking the buyer’s psychology into account. It’s the offer, the narrative you construct around it and the other options you give with it that persuade people to buy. Not just a winning product. Let me know in the comments about your multiple upsell offer strategy and how you plan to go about it. Will you offer a choice between two offers or three? Will you encourage people to buy a greater volume of the same or increase the value as the price of the plan goes up? Learn more about UpStroke’s multi-product add-on here.